Recent research has shown alarming amounts of harmful chemicals in many sunscreen brands. Thankfully, there are safe ingredients like titanium dioxide that still provide protection from the sun’s harmful UVA and UVB rays—without causing further damage to your skin. What are some of the harmful ingredients found in sunscreen? Oxybenzone is one of the worst offenders. It’s a synthetic estrogen that can penetrate the skin and disrupt your hormone system, causing cell damage that can lead to skin cancer. Always be sure to look for Oxybenzone free sunscreens that provide sun protection without damaging your skin. Another harmful ingredient to watch for is retinyl palmitate (a type of vitamin A). Titanium dioxide is an inert mineral used in sunscreen and cosmetics to thicken, whiten, and lubricate while offering protection. It provides similar protection to zinc oxide sunblock. Colorescience offers a variety of titanium oxide and zinc oxide sunscreen powder, whether you’re looking for full-body solutions or zinc oxide mineral sunscreen for the face. Does Colorescience offer titanium dioxide sunscreen? Colorescience offers a variety of options for titanium dioxide sunscreen, so you can keep your skin safe as well as gorgeously illuminated. 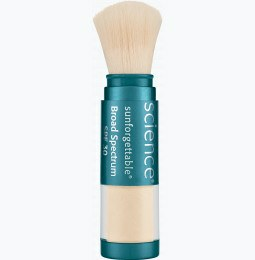 Sunforgettable Brush-on Sunscreen provides SPF 50 against the sun’s harmful UVA and UVB rays. It’s also quite versatile, as it can be worn alone or over makeup. Colorescience sensitive skin sunscreen with titanium dioxide offers gentle protection designed to be easy on the skin. 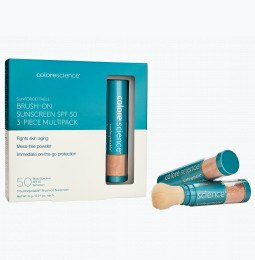 Does Colorescience have convenient sunblock options? 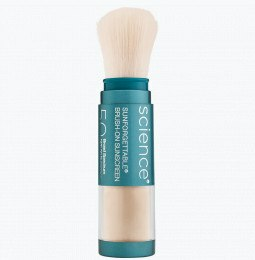 Our brush-on mineral sunblock powder sunscreens are pocket-sized and can be worn alone or over cosmetics, making them a convenient option for any on-the-go person. Throw any of these options for titanium dioxide sunscreen in your purse, pocket, or sports bag to ensure safety from the sun and protection from skin damage.